The advent of high-resolution digital cameras and sophisticated multi-view stereo algorithms offers the promise of unprecedented geometric fidelity in image-based modeling tasks, but it also puts unprecedented demands on camera calibration to fulfill these promises. 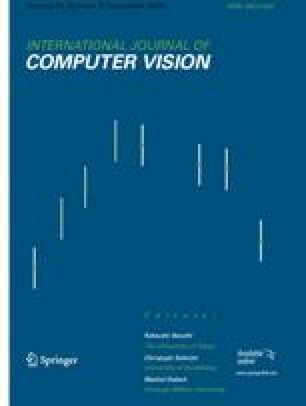 This paper presents a novel approach to camera calibration where top-down information from rough camera parameter estimates and the output of a multi-view-stereo system on scaled-down input images is used to effectively guide the search for additional image correspondences and significantly improve camera calibration parameters using a standard bundle adjustment algorithm (Lourakis and Argyros 2008). The proposed method has been tested on six real datasets including objects without salient features for which image correspondences cannot be found in a purely bottom-up fashion, and objects with high curvature and thin structures that are lost in visual hull construction even with small errors in camera parameters. Three different methods have been used to qualitatively assess the improvements of the camera parameters. The implementation of the proposed algorithm is publicly available at Furukawa and Ponce (2008b). Bouguet, J. Y. (2008). Camera calibration toolbox for matlab. http://www.vision.caltech.edu/bouguetj/calib_doc. DXO (2008). DxO Labs. DxO Optics Pro (http://www.dxo.com). Furukawa, Y., & Ponce, J. (2008b). PBA. http://www.cs.washington.edu/homes/furukawa/research/pba. Furukawa, Y., & Ponce, J. (2008c). PMVS. http://www.cs.washington.edu/homes/furukawa/research/pmvs. Lourakis, M., & Argyros, A. (2008). SBA: A generic sparse bundle adjustment C/C++ package based on the Levenberg-Marquardt algorithm. http://www.ics.forth.gr/~lourakis/sba/.